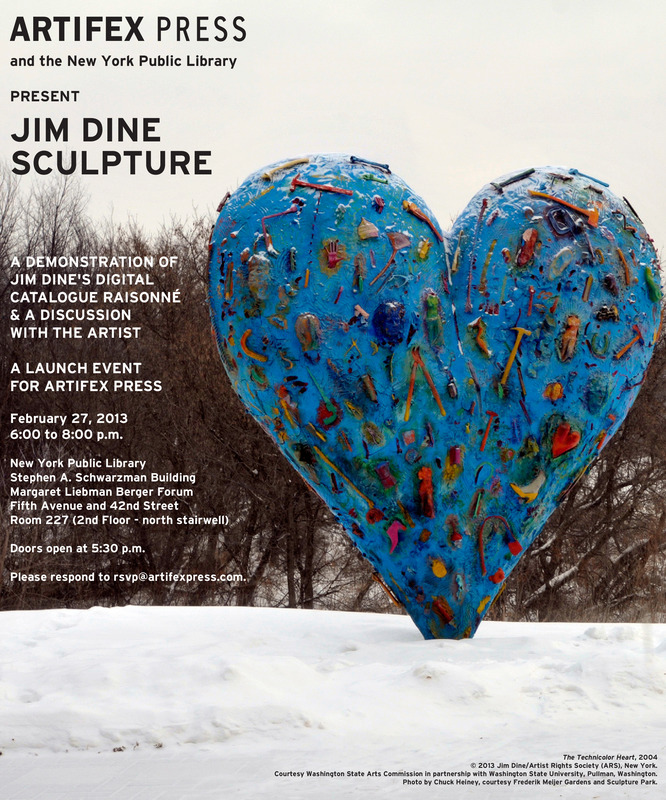 Please join Artifex Press on February 27, 2013, for the release of Jim Dine: Sculpture, 1983-present, a searchable, sortable interactive web publication detailing the artist’s renowned works in three dimensions. This event features a demonstration of the Artifex Press digital catalogue raisonné platform, followed by a discussion with Jim Dine; Sara Davidson, Editor of the Jim Dine Catalogue Raisonné; and David Grosz, Editor in Chief of Artifex Press. The event will take place at the New York Public Library on February 27, 2013, from 6:00 to 8:00. Please respond to rsvp@artifexpress.com. Berger Forum doors open at 5:30 p.m.
Room 227 (2nd Floor - north stairwell).